A new exhibit is on display at Town Hall chronicling the town’s history, dating from 1713, when Berwick separated from Kittery, through South Berwick’s incorporation in 1814. Presented by the Old Berwick Historical Society, the small exhibit, titled “Becoming South Berwick: Surviving the Revolution,” is situated by the elevators on the second floor. The exhibit is being offered in conjunction with South Berwick’s upcoming bicentennial observances in 2014. Historical society member Cari Quater developed the display, drawing on an array of historic objects, illustrations and maps from the Counting House Museum collection. She was assisted by Norma Keim, who guided the project and research. The society has also posted new articles about South Berwick history on its website. Beginning in January, the society will welcome the public to monthly public lectures, tours and other programs focused on the history of the town in the 1800s and 1900s. A larger bicentennial exhibit at the museum is planned for summer. A recently installed art project at Kennebunk Elementary School is expected to far exceed the display time of any past student art exhibit on the school’s walls. Last week, the school unveiled the students’ handiwork: a massive ceramic and glass tile mural, featuring an underwater scene of a large octopus surrounded by starfish, turtles, sea horses and other aquatic life. The project began over a two-week period last spring, when 470 kindergarten through grade 3 pupils (including current Sea Road School grade 4 students) worked with KES artist-in-residence, Rob Rossel (owner of Symmetry Tile Works of Epping, N.H.), and his assistant Greg Thibodeau to create the 256 individual tiles that make up the ocean scene. The students worked in pairs designing and glazing the tiles while learning about global sustainability. They exclusively used eco-friendly ceramic clay and recycled glass along with rocks, shells and sand dollars found at Goose Rocks Beach in Kennebunkport. The project was jointly funded by the Kennebunk Elementary Parent Teacher Association and the Education Foundation of the Kennebunks and Arundel. For more details, call KES Principal Ryan Quinn at 985-4402. Timeless Cottage won first place and a $500 cash prize; Trendy Closet won the title of Most Sparkle Power and a $250 prize; It’s All Good, won the title of Most Creative display and a $100 prize. Honorable mentions went to Norway Savings Bank for creativity and Morning Glory for Sparkle Power. For more details, go to: www.brunswickdowntown.org. 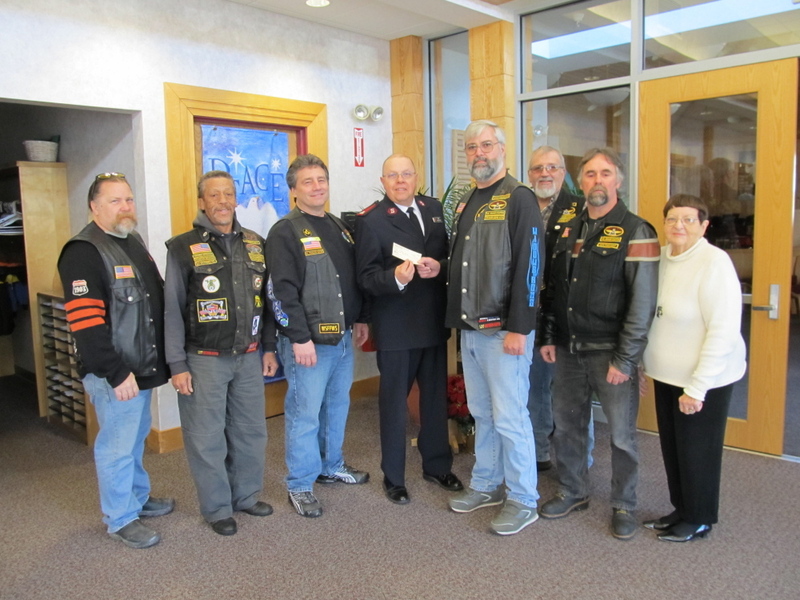 The Widows Sons Maine Grand Chapter recently presented a check in the amount of $500 to Maj. Bryan Smith, commanding officer of the local Salvation Army, for the work the organization does within the community during the holiday season. The Widows Sons, founded in 1998, is an International Masonic Motorcycle Association comprised of Freemasons, which exists to aid and assist widows and orphans of Master Masons. Rep. Chellie Pingree has announced her office’s nominees to the U.S. service academies – the U.S. Naval Academy at Annapolis, U.S. Military Academy at West Point, U.S. Air Force Academy at Colorado Springs and U.S. Merchant Marine Academy at Kings Point, N.Y., based on their demonstration of exceptional leadership, high academic standards and service to others. The nominees were interviewed by a panel of six on their academic record, test scores, leadership ability, involvement in extracurricular activities and exemplified commitment to serving their country. Pingree nominated several students to more than one academy. U.S. Naval Academy – Paul Babirak, Scarborough; Andrew Benger, Cumberland; John Bennett, Chelsea; Emily Cox, Tops- ham; Wesley Crawford and Liam Mahoney, both of Yarmouth; Tyler Davidson, South Berwick; Grace Rabinowitz, Brunswick; and Robert Runnells and Erin Donlon, both of Saco. U.S. Air Force Academy – John Bennett, Chelsea; Wesley Crawford, Yarmouth; Joshua Engelhardt, Windsor; Angus Ferrell, Falmouth; Patrick O’Hanlon, Falmouth; Edward Pond, Topsham; Robert Runnells, Saco; Matthew Shea, South Berwick; Jordan Susi, South Portland; and Brian Taylor, Falmouth. U.S. Merchant Marine Academy – John Bennett, Chelsea; Wesley Crawford and Liam Mahoney, both of Yarmouth; Chris Tomascak, Portland; and Meredith Willard, South Portland. York Public Library at 15 Long Sands Road has announced a change in hours in observance of the holidays. The library will be open from 10 a.m. to 2 p.m. Tuesday and Dec. 31. The facility will be closed Wednesday and Jan. 1. For more details or a complete list of events, call 363-2818 or go to www.york.lib.me.us. A “Coats for Seniors” campaign, sponsored by the Merrymeeting Bay Triad and the Maine Area Agencies on Aging, has garnered 930 gently worn adult winter coats to help ensure that every older Mainer stays warm this winter. For every coat donated, L.L. Bean contributed $5, for a total of $4,650 to the Maine Agencies on Aging to also provide fuel assistance for seniors. Coats were collected at locations across the state and taken to the L.L. Bean Flagship Store in Freeport. The first 100 people donating coats also received a coupon for a free Ben & Jerry’s ice cream cone. Ben & Jerry’s also donated 100 percent of the profits from sundaes sold Nov. 23 at its Freeport location. The Pine Tree Council, Boy Scouts of America, recently donated $22,000 in popcorn to the Maine National Guard for distribution to military families. The goods were raised during the Scouts’ annual popcorn fundraiser sale, benefiting 2014 Scouting programs. Some 170 cases of product, totaling 1,200 individual pieces, were shipped to the Portland Armory for distribution to 400 military personnel and their families. Wells High School recently observed Substance Abuse Awareness Day, featuring guest speaker Charles “Chucky” Rosa of Seabrook, N.H.
Rosa, who offers workshops and speaks to students about the hazards of substance abuse, shared his experience of losing two sons to accidental drug overdoses. After speaking, Rosa offered to give special “dog tags” to any student who pledged to avoid alcohol and drugs and to make good decisions. The dog tags serve as a symbol and reminder of that pledge. About 90 percent of students received Rosa’s tags.